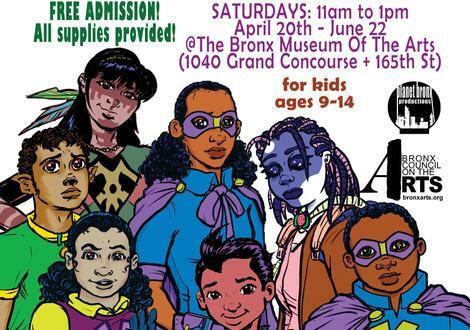 Register your kids (ages 9 to 14) for the 2019 COMIC CULTURE SPRING cycle. Focusing on comics, manga, writing and even basic Photoshop, we will use the multicultural legends and styles of our dynamic Bronx landscape. Guest speakers will include professional cartoonists and artists from all over the world. All art supplies are provided free. or call us at 347-427-7553. The classes are every Saturday, 11AM to 1PM, from April 20th to June 22nd. They take place on the 3rd floor of the Bronx Museum.